A GIFt—or three!—from me, to thee. I don’t talk about it much, but I have a little website called bukk.it. I put dumb images in it, which I use to subtly emote on Twitter, or to pollute chat rooms I share with friends. That’s about it. The site’s occasionally used by folks other than me, which is impossibly gratifying for something I made for myself. It’s gotten to the point where strangers will send me suggestions for new files to add. Which is wildly flattering, but I’d love to see people add the images to their own image repositories. So! In case you’re moved to set up your own website to host your own dumb images—look, it could happen—here’s how I currently manage the bukk.it. The bukk.it folder on my laptop, which contains all the images that’ll be served from my website. Okay, so this is the unclever bit: I have a folder on my laptop filled with several thousand images, each of varying levels of inanity. So. [extremely Captain America voice] You’ve got a massive folder of images, and you’d like to put them online. Personally, I use Transmit, a Mac-based SFTP client lovingly designed by Panic. The main reason I use Transmit? Well, it has this nifty feature called DockSend, which allows you to “bookmark” servers in your Mac’s Dock. For example, I’ve got an icon in my Dock titled BUKK.IT. With that, I can drag files directly onto the icon, and they’re uploaded to the bukk.it. Transmit even copies the URLs of any uploaded files to my clipboard, which is just a treat. That’s just about it: save an image to a folder on my laptop, drag it to my Dock, watch it upload. I should note that this used to be an ever-so-slightly-fancier two-step process, in which I used Automator to, uh, automatically upload any new images added to the bukk.it folder. But at some point in the last year or two, Automator stopped working. So! Dragged files, it is. I should also note I feel more than a little sheepish in admitting I use SFTP in twenty-frickin’-eighteen. In fact, I’ve gotten a few requests over the years to put the whole thing in a public GitHub repository. Sadly, their file size limits make it impractical. This is how I have things set up, mind—as with most things, there are tons of other approaches. For example, if you wanted to store your images on something like Dropbox, Jonnie Hallman’s got one of the finest write-ups I’ve seen on how to do that. That’d save you from having to mucking around with your own custom domain name. (Personally, I wanted to muck with my own custom domain name.) At one point, I looked into moving things over to Amazon Web Services, but I really hated the idea of giving up the directory listings I get on the bukk.it, which makes it trivially easy to sort by, say, the newest images in the directory. Also, I do occasionally dream of running the bukk.it through a little CMS. Zach Leatherman’s written a really nice-looking static site generator called Eleventy, and his first tutorial focuses on making a website for a GIF collection. Hmm. But like I said: this is how I’ve got things set up. And what works for me might not work for you. All I know is that if you set up your own repository of weird images, I’d love to check it out—and hey, maybe you could write a little bit more about how you manage it, too. Trivia time! 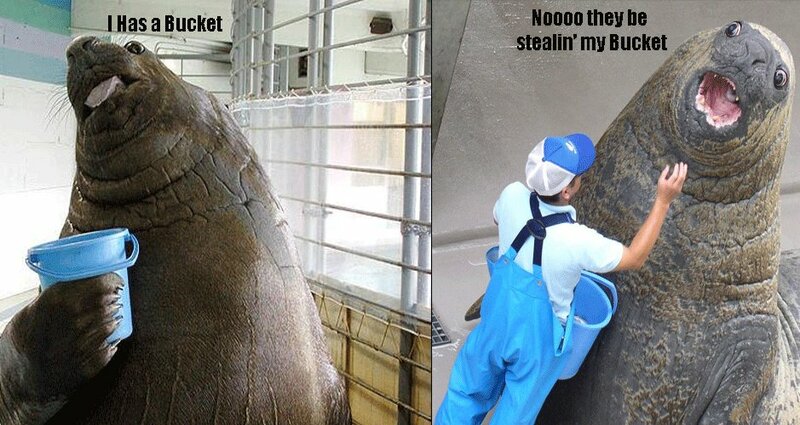 The domain name came from me wildly misremembering how “bucket” was spelled in this ancient, creaky ol’ meme. So. Now you know.